On The Americans, Russian spies do their best to keep their activities secret. Conversely, FX is hoping this show will be something everyone is talking about. Will it be a ratings smash or will it be cancelled instead? Stay tuned. This TV show takes place in the Reagan era and follows two KGB agents who are posing as Americans in a Washington DC suburb. The cast includes Keri Russell, Matthew Rhys, Holly Taylor, Keidrich Sellati, Maximiliano Hernández, and Noah Emmerich. The ratings are the best way to tell if The Americans will be cancelled or renewed for a second season. The first season typically airs on Wednesday nights on FX. There are 13 installments. Final season averages: 0.7 rating in the 18-49 demographic with 1.80 million total viewers. 0.6 demo rating (+20% change) with 1.74 million (+17% change). Season averages: 0.66 in the demo with 1.795 million. 0.5 demo rating (-17% change) with 1.49 million (-18% change). Season averages: 0.67 in the demo with 1.80 million. 0.6 demo rating (0% change) with 1.81 million (+21% change). Season averages: 0.68 in the demo with 1.83 million. 0.6 demo rating (+50% change) with 1.50 million (+9% change). Season averages: 0.69 in the demo with 1.83 million. 0.4 demo rating (-33% change) with 1.38 million (-17% change). Season averages: 0.70 in the demo with 1.87 million. 0.6 demo rating (0% change) with 1.65 million (-3% change). Season averages: 0.74 in the demo with 1.93 million. 0.6 demo rating (-14% change) with 1.70 million (-9% change). Season averages: 0.76 in the demo with 1.97 million. 0.7 demo rating (+40% change) with 1.88 million (+30% change). Season averages: 0.78 in the demo with 2.01 million. 0.5 demo rating (-38% change) with 1.44 million (-25% change). Season averages: 0.80 in the demo with 2.04 million. UPDATE: FX has renewed The Americans for a second season. 0.8 demo rating (+14% change) with 1.91 million (+16% change). Season averages: 0.88 in the demo with 2.19 million. 0.7 demo rating (-13% change) with 1.65 million (-16% change). Season averages: 0.90 in the demo with 2.28 million. 0.8 demo rating (-33% change) with 1.97 million (-39% change). Season averages: 1.00 in the demo with 2.59 million. 1.2 rating in the 18-49 demographic with 3.22 million total viewers. Season averages: 1.20 in the demo with 3.22 million. It was a very positive start for the new series. According to FX, the debut drew 4.7 million viewers between both of the night’s airings — more than the debuts of American Horror Story and Sons of Anarchy. What do you think? 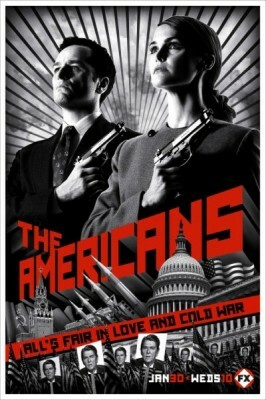 Do you like The Americans TV series? Do you think that it should be cancelled or renewed for a second season? Just first season almost done with it I can’t wait for second season it best show out there history telling story that was true at time period. It awesome show for adult only. AN EXCELLENT SHOW. THIS ERA WAS BEFORE I CARED ABOUT POLITICS OR RUSSIA. VERY INTERESTING TO SEE HOW “IT” WORKS.